Last week, I received a lovely surprise from Teri at Climbing the Willow, she let me know she had nominated me for a Liebster Award! 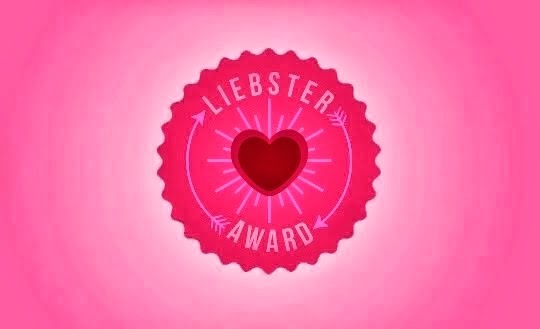 What exactly is a Liebster Award, you may ask? It is basically a blogger-to-blogger award meant to recongnize blogs with small readership and to help widen their audience. Thank you so much for the shout-out Teri!! When nominated for a Liebster Award, the nominee must answer the questions from the nominator and provide 5 random facts about her or himself. Then the nominee pays it forward by nominating more small blogs for the award and sending them more fun questions, normally by leaving a comment on the nominated blog with a link to the nominating post. 3. How many unfinished projects do have laying around? And if you don't have any, what's your secret? No secret here :) I have tons. The first of which is the quilt I attempted as my very first sewing project. Ambitious much? And I spent way too much money on that crazy thing. Yet, there it sits. In a box. Someday I will finish it :) I have several projects cut out, that for whatever reason never made it to my sewing machine. I also have fabric laying around that I bought for certain projects that I still have intentions of doing, it's all just a matter of finding enough time to do them all. All while making the things that keep piling on top of those things. My mind never stops! 4. What's your favorite movie? I'm honestly not much of a movie watcher. But I do LOVE The Sound of Music and Mary Poppins equally :) I'm more of a TV show junkie. White Collar is my absolute fave! I can only do a hairstyle for 9 months. After that I need a change. Why not a year? No clue. I was born and raised in Ohio. My entire adult life I have always wanted to move to NC. Again, don't know why? I have now lived in NC for 4 years. I'm a happy girl. I started turning gray at 19. I cover them shamelessly. My husband was my first and only boyfriend. We had our first date when I was 20. We were married 11 months later. I have a huge sweet tooth. It's hard to pick a favorite. But going out for icecream is at the top of the list. Amos-El - Amy has such great taste. I love the clothes she makes for her amazingly cute kids. Her style is so great, as is her photography. She blogged about this fantastic dress last week, I am absolutely smitten with it!! I Seam Stressed - My friend Tasha is going places. She started blogging at I Seam Stressed right around the time I did here, and she has definitely made her mark in the sewing world! She has amazing craftsmanship and an eye for style. This tiny stripey Geranium is one of my all time favorites, but check out this page for some eye-candy! Simple Love - Amber is actually my real-life friend!! We get together with our kiddos and just hang out or to sew!! We laugh because our tastes are so very opposite in every way. She loves quilting and I love garment sewing. Yet we have so much in common and love everything the other person does :) She is currently at Sew South (a little jealous) so stay tuned to her blog for all the amazing awesomeness she is experiencing there! See what I mean about her lovely quilts? And I haven't even mentioned the amazing photography her blog is just bursting with. She'll even take your pictures if you like! 1. What is your favorite thing you've ever made? It can be sewing or not. 2. If you would not have discovered sewing, what would your favorite hobby be? 3. If money were no object, what would your dream sewing set-up be? 4. What led you to start blogging? I'm so honored to have been nominated Teri, THANK you again!! Haha, just a magical pull I guess ;) We do absolutely love it, don't know if we'll ever leave again. Probably not unless it means retirement in Florida, lol!